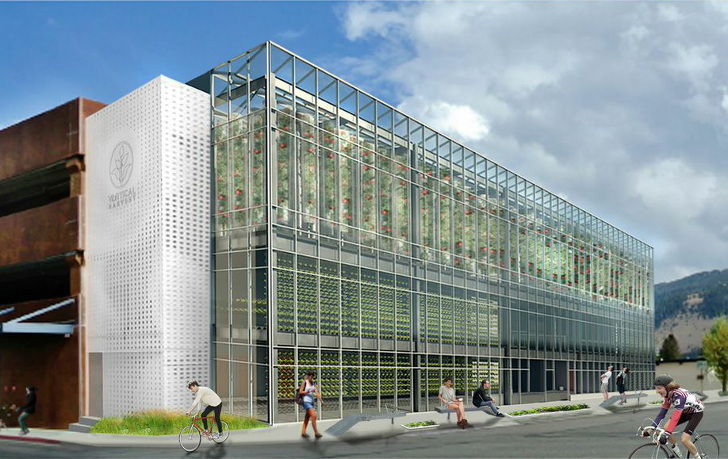 A 30 foot by 150 foot sliver of land located next to a parking lot in Jackson, Wyoming is set to be transformed into a vertical farm that will produce up to 100,000 lbs of produce each year. 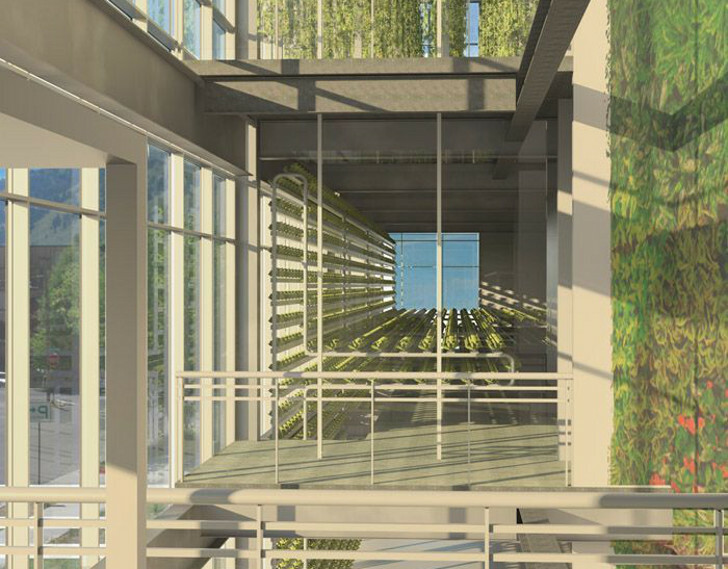 Using 90 percent less water than conventional farming, and absolutely no pesticides, the three-story Vertical Harvest greenhouse will enable the cold, land-locked city to provide locally-grown produce for its residents all year round. The Vertical Harvest farm is designed by E/Ye Design and utilizes a 30 by 150-foot plot of unused city land that sits next to a parking lot in Jackson, Wyoming. Through an efficient building design, and the use of hydroponic farming techniques, the 4,500 sq ft footprint will have 18,000 sq ft of growing area. Within this area, the farm will produce over 37,000 pounds of greens, 4,400 pounds of herbs, and 44,000 pounds of tomatoes. This is a significant amount of fresh produce for the town of 9,577, and provides residents with a locally-grown alternative that Jackson’s climate previously prevented. Located one mile above sea level, the town is blanketed in snow for months on end, and is therefore forced to import much of its food. In addition, the developers behind the farm have been careful to plan to grow only produce that is currently imported—thereby not competing with local farms, but rather bolstering local businesses by saving on transportation costs. The 150-foot-long greenhouse facade of the building optimizes the potential for natural light, which both improves photosynthesis and cuts down on energy costs for the facility. There will be times when artificial light is required—for instance, it is impossible to grow tomatoes during a frozen winter on natural light alone—and so grow lights will be installed in order to ensure that the farm meets production goals. Not only will the Vertical Harvest provide fresh produce for Jackson, it will also serve as an educational facility, with a “small but functional ‘living classroom’” and access for visitors to view the growing areas without contaminating the crops. Vertical Harvest recently broke ground, and growing will commence later this year. I found this site from a shared post on facebook. Lots of very useful info. This vertical garden is more than I need but the ideas I can downsize for my situation. The Vertical Harvest farm is designed by E/Ye Design and utilizes a 30 by 150 foot plot of unused city land that sits next to a parking lot in Jackson, Wyoming. Through an efficient building design, and the use of hydroponic farming techniques, the 4,500 sq ft footprint will have 18,000 sq ft of growing area. Within this area, the farm will produce over 37,000 pounds of greens, 4,400 pounds of herbs, and 44,000 pounds of tomatoes. This is a pretty significant amount of fresh produce for the town of 9,577, and provides residents with a locally-grown alternative that Jackson's climate previously prevented. Located one mile above sea level, the town is blanketed in snow for months on end, and is therefore forced to import much of its food. In addition, the developers behind the farm have been careful to plan to grow only produce that is currently imported—thereby not competing with local farms, but rather bolstering local businesses by saving on transportation costs. Although the grow lights will require a certain amount of energy, Vertical Harvest founders Nona Yehia and Penny McBride have stated that it still constitutes net energy savings over imported produce, and while HPS (High Pressure Sodium) bulbs will be used for the tomatoes, LEDs will be utilized for the "lettuce varietals, microgreen and propagation areas." Not only will the Vertical Harvest provide fresh produce for Jackson, it will also serve as an educational facility, with a "small but functional ‘living classroom’" and access for visitors to view the growing areas without contaminating the crops. Vertical Harvest recently broke ground, and growing will commence later this year.